VANCOUVER, Wash. - She's cute, smart, and registered as a lethal weapon in the state of Washington. 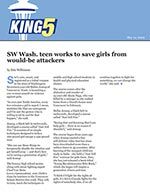 Seventeen-year-old Dallas Jessup of Vancouver, Wash. is launching a one-woman assault on violence against girls. “In even just North America, every two minutes a girl is raped. I mean, statistics like that are outrageous and I'm not the person who is willing to sit by and let that happen,” she said.